My scientific training and my love of discovery mean I'm always experimenting. These scarves are 73% silk and 27% wool. The wool component means the images are sharper and the colours tend to be more intense. The scarves are a generous size, 60" by 11". Soft and snug, wearing one of these is sheer pleasure. If you are interested in any of these please contact me at lee.bisset @ ihug .co .nz. You'll need to remove the spaces. There is a view of the entire mauve and green scarf on the previous post. My first experiment in marketing was my eco print scarves was at the Mercury Bay Art and Craft Fair. My scarves were admired by many, purchased by some and I learnt heaps especially from my fellow marketers felter Greta and flax weaver Bernie from Whangamata. Thanks very much to both of you for your humour and help. Bernie and Greta shared their space which made for a more interesting display. After 5 months of experimenting, I was confident enough to purchase some silk scarves and begin eco printing them with the idea of selling my work. Since I showed them at Thames Creative Fibre last week and uploaded some to my Felt shop they have been selling like hot cakes. 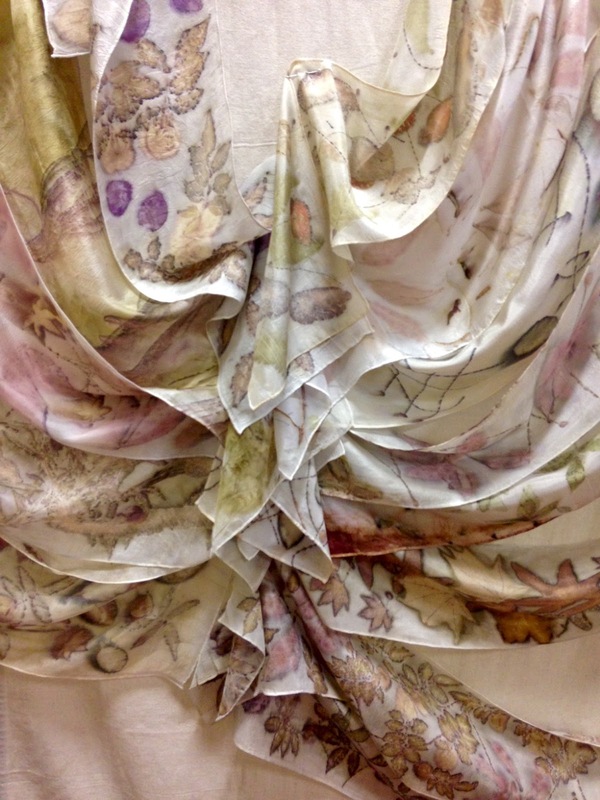 Using only pigments found naturally in the plants, the printed scarves have fine details and mostly delicate colours. I plan to make more soon that give pinks and purples. What I like the most are the surprises when a new colour emerges from a leaf or petal and the gentle impact of this craft on my environment. Leaves return to the earth via the compost, mordants are simple like rusty nails and seawater. I use steam to extract the pigments and I gather the plants on walks or sometimes I spot them on road verges or in friend's gardens. I've even knocked on doors and asked if I could gather samples. No one has ever said "No". I've used metres of silk testing plants and always there are surprises. These have all sold but I will put more photos in more recent blogs. After eco printing paper I was keen to start printing on silk. I bought India Flint's books Eco Colour and Second Skin and was stunned by he possibilities. I didn't know where to start. I tried printing using frozen flowers. These are morning glory flowers with an old rusty nail. I tested many kinds of leaves. Here are peach. These are eco prints of red canna lilies. They gave 2 pigments, a blue purple as well as a red violet. During a visit to Rotorua I collected 5 bottles of water from steaming pools but none of them gave me good prints. However some leaves that my husband and I gathered in the dark gave the print below. I used seawater with rusty nails as the mordant. I was thrilled with the detail. Finally I tried boiling up some fronds of the male fern ( an introduced weed) to make a dye. I was rewarded with a lovely green. I came across Cassandra Tondro's blog on leaf printing and became hooked on the concept of transferring leaf prints directly onto paper by steaming. The process appealed to the scientist in me which loves to experiment as well as the conservationist. Here was a sustainable way to dye paper that used only steam, leaves and flowers. Here are 2 pages with some of the plant material still in position. Can you spot the individual bottlebrush flowers - even the detail of the stamens and pollen shows. Above are frozen morning glory flowers with bottlebrush florets and canna lily flowers. The set up with the paper tied between cardboard sheets, the scallops provide a flat surface for the weight. The water is under the rack. Back to blogging at last. The first half of 2016 has been difficult but now I'm back into my spinning, weaving and my new love eco printing. I'm still in love with spinning Gotland from the curl. I hold each lock sideways and spin from the centre of the lock making a lovely soft yarn with little curls. I spun and spun and spun until I had enough yarn to make my husband a knee rug though I have to admit that since it has been finished I may have used it more often than him. Yes that's the warp and weft handspun. Dyeing the curls red gave an tan brown colour on the tips. As my loom is only 50 cm wide I made 2 lengths for the rug and stitched them together. I didn't try to match the weft or warp threads. Most of the warp threads are 2 ply but most of the weft threads are spiral plyed with a fine commercial laceweight. Those delightful curls in the finished rug. A month before Christmas my grandson discovered a new way of weaving in a children's book. He was very excited about this idea. So on the first morning of the grandkids' holiday with me this summer we made looms and began weaving. We'd woven several times before but never with a loom. The next morning they finished. Just look at the concentration. The shoe boxes with iceblock sticks worked well for the older two..
A couple of weeks later the oldest sent me this photo with the message "Hi nana, I designed and made it all by myself!" What amazing creativity. Welcome. Lately I've become fascinated by printing details from leaves directly on silk and wool using dyes extracted from plants themselves. After hours of gentle steaming the excitement builds as I unwrap each bundle to reveal the prints. Fibres have fascinated me all my life, whether I’ve been spinning, dyeing, weaving, quilting, knitting, felting and now eco printing.